From Dead Man’s Curve on Sunset to the impossibly short on-ramps of the Arroyo Seco Parkway, Los Angeles roadways offer many opportunities for white-knuckled motoring. But perhaps none is as terrifying—or as thrill-inducing—as Baxter Street. Tracing a straight line through Echo Park and Silver Lake, the road seemingly thumbs its nose at the underlying topography, crawling over hills and plunging into ravines. One stretch between Allessandro and Alvarado claims a 32 percent grade, among the steepest in the city. Just over the hill past Lemoyne, a grid pattern embedded in the concrete helps tires better grip the road. Today, the city caps street grades at 15 percent, and new roads generally conform to the contours of the landscape. So how did such a street as Baxter ever get built? It began as a sliver of land in an 1853 survey, separating empty real estate tracts in what was then the city’s northwest corner. The city designated that narrow strip Baxter Street in 1872, and when subdividers eventually carved those empty tracts into housing developments in the late 1890s, they honored the surveyors’ lines and imposed a grid pattern on the hilly land. Then, the arrow-straight line of Baxter Street made some practical sense. 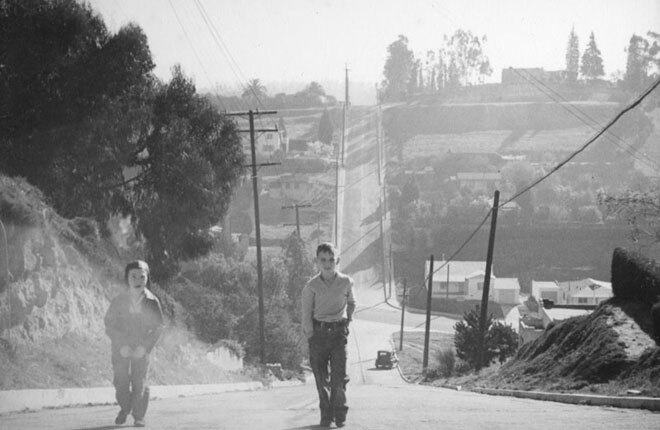 As Matthew Roth of the Auto Club Archives notes, the road—like many of L.A.’s so-called secret stairways—functioned as a pedestrian access path for a streetcar line along present-day Echo Park Avenue. Above: Photo by Herman Schultheis, courtesy of the Photo Collection — Los Angeles Public Library.